sfk list, lindex, (x)find, (x)hexfind, filter, snapto, md5gento, filefind. archive file contents must fit completely into memory. in general, archives below 100 mb should be ok, but beyond that your machine must provide enough memory. zip files must use a normal compression format (DEFLATE), e.g. as it is produced by the InfoZIP or WinZIP tool. (most zip files in the internet use DEFLATE compression.) exotic compressions and 64-bit zip files are NOT supported. .tar, .tar.gz and .tar.bz2 files produced by non-Windows/Linux operating systems, or produced by old and exotic tar tools may slightly differ in their format, and may fail to read. To make sure than you can load the archive files you're most interested in, test loading first in SFK Base (using the XE Demo mode). take a look at Depeche View Professional. by the amount of available memory. done in 25 seconds on a Core i3 CPU with 2.13 GHz. Execution times are heavily dependent on content, search patterns, and hardware. But in general, replacing within a gigabyte file is a matter of minutes, not hours. Search and Replace using wildcards and SFK Expressions. allowing to search for character classes like [chars of a-z0-9] or [bytes not \x00]. They are of limited flexibility, but easy to write and understand. by command xreplace, in multiple files, and in large files not limited by the memory. as an installer that installs a 32-bit binary running on 32 and 64 bit Windows. Swiss File Knife XE comes with a special No Admin Installer, allowing installation on every machine, even without admin rights. 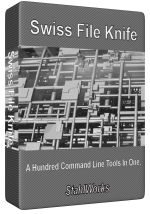 By default, Swiss File Knife does not install to a path within C:\Program Files (which would require admin rights) but suggests a path C:\app\sfk. Optional admin installation to Microsoft standard location. For company admins, there is also an option to install Swiss File Knife XE to the Microsoft standard location C:\Program Files (x86). This option requires admin rights. Under Windows 7/8, the installer will require two additional clicks. Under Windows XP, the installer must be "Run As" with an administrator account. Installing as admin ist just an option, but not required for companies. Portable Installation to USB stick. 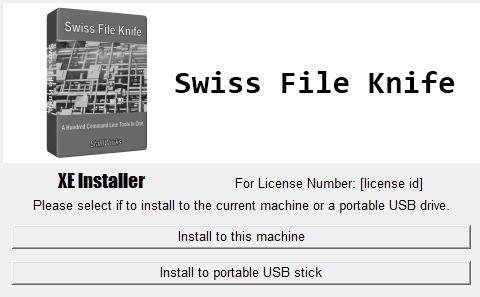 The Swiss File Knife XE installer contains an option to install Swiss File Knife to a portable USB stick. You may then insert that stick into any Windows machine and run Swiss File Knife directly from that stick. The portable binary cannot be used under Linux/WINE. Also see the installer screenshots below. The Swiss File Knife XE Installer already contains the license ID. You simply make a few clicks to install as shown below. Company admins run the installer the same way on every target machine. The installer supports a command line option -silent to install instantly without any dialogues (Search "silent installation" in the help text for details). All license participants use the same license ID. The license owner (company admin) himself should keep track of the total number of installations and users. Swiss File Knife XE contains no automatic checking, especially no dongles, no network messages, no license server or live activation. you can download that one as well, for free. Discount upgrades after one year. Please note: before you purchase XE, it is required that you have some experience with the freeware edition, SFK Base, and know how to use a command line program. Play around with sfk xfind, sfk xed and the sfk xreplace demo. As soon as you can use SFK Base successfully to find text patterns within files, and to edit a file content with xed using Simple Expressions, then you are ready to purchase XE. No matter if you need 1 license or 127, we will be happy to reply with a price quote. Please note that payments by wire transfer will take 2-3 business days for processing. In German: gerne können Sie auch per Überweisung auf unser Deutsches Girokonto bezahlen. Senden Sie hierzu eine EMail "Bestellung SFK XE" mit Name, Adresse, EMail und ggf. Anzahl Lizenzen an Sie erhalten dann Antwort mit einer Bestell-Nr. und Zahlungsinformationen. Zahlungen per Überweisung können 2-3 Werktage dauern. 1. Click on the Buy Now button above. 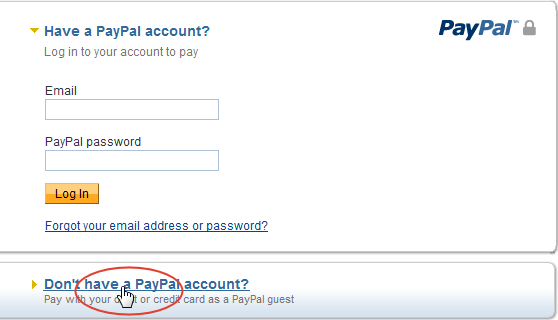 Click on Don't have a PayPal account. 3. 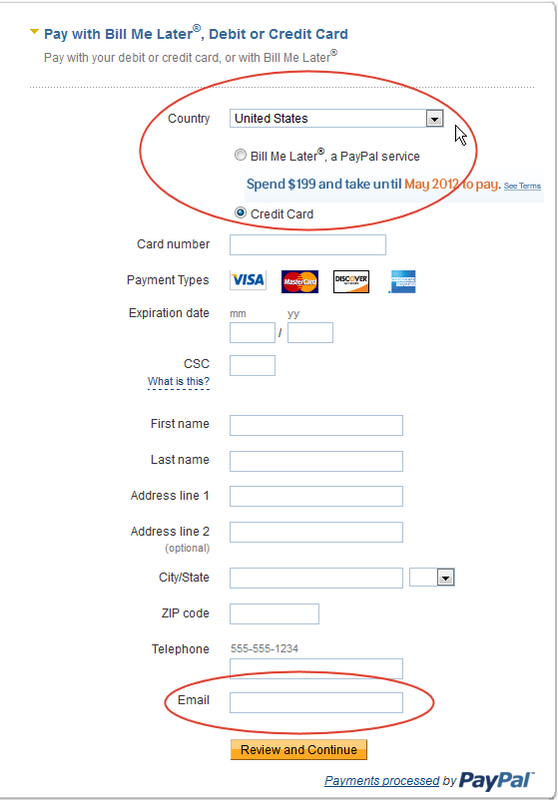 PayPal will present an instant credit card payment form. e.g. bank accounts. Fill in your credit card or bank account informations. Double check your e-mail address when entering. It will be used for sending download informations. After payment, you may be given the option to continue to my website. Please do so, as you will be given instant download informations on screen (the same as in the email, for extra safety). Start screen. Select installation to the current PC or to a stick. Installation to PC: Select target folder, click Install, done. Installation to stick: Select target folder on stick, click Install, done.